Abbey Lodge 2529’s hard-working Charity Steward, W.Bro. John Cooper and his dear wife Sue died whilst on holiday in August 2018. John worked tirelessly to raise funds for local, regional and national charities, both Masonic and non-Masonic. Abbey Lodge will be holding the inaugural Cooperman Memorial Shoot on 15 August 2019. Planning is in its early stages but we hope you will be able to give it your full support as a tribute to John and Susan. As a tribute to departed merit we have put together a photo album mainly featuring John but with Sue in a cameo role as recognition of the work done and the good times we’ve had together. Number 12 Accrington Road often referred to as the Union Club was a Gentleman’s Club. The members were well-to-do Whalley men and met to play cards or snooker in the quiet surroundings of the Union Club. Wanting to take things perhaps to another level someone suggested forming a Freemason’s lodge. But none of the Union Club members were actually ‘in the Craft’. 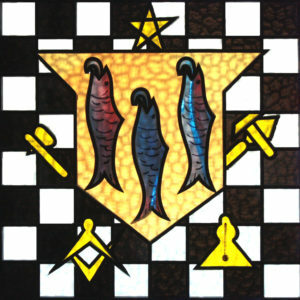 So it was that others known to the members sponsored the formation of Abbey Lodge number 2529 in the Register of the United Grand Lodge of England. A further issue was where to meet. Union Club was the obvious answer but space was at a premium. So a small Lodge Room was constructed to the rear of the Club. It was slowly and lovingly equipped with the right furnishings. Some of the panelling is reputed to have been salvaged from the local Abbey ruins. The panels had found their way into a local house. The panelling was carved by a local craftsman and is a joy to behold. 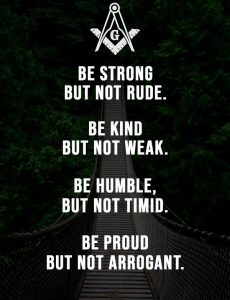 We have no compunction calling our Lodge Room Lancashire’s Little Gem for these reasons. Some locally famous men have been members of Abbey Lodge. Visiting Whalley Golf Club many of the long time trophies and competitions are named after several of the founding or early members. One that stands proud is Dr Postlethwaite. The Worshipful Master of Abbey Lodge and his lady will be hosting their Ladies Night at Burnley Football Club on Friday 26 April 2019. A great night of dining and dancing is in store for those attending. The carved list of Abbey Chapter First Principals has been brought up to date by W. Bro Alan Dunicliff. One board has been carved with names up to 1999 and a new board sourced and carved with names up to 2018. The new board was presented to the Chapter at its Installation Meeting in April 2019 and will be installed in a suitable position in the East of the Lodge Room. Photos will follow shortly. 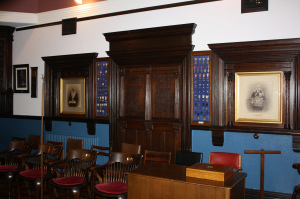 Though only a small meeting place the oldest Lodge meeting at Whalley – Abbey Lodge 2529 – is a thriving Lodge with a steady influx of joining and new members (initiates). Abbey Lodge has a full, family orientated social programme which allows prospective members the opportunity to meet Lodge members in a social environment. Always a friendly welcome at Whalley!